Receiving, inspecting, loading, segregating, and delivering installation supplies and equipment. Preparing all unit and organizational supply documents. Maintaining automated supply system for accounting of organizational and installation supplies and equipment. Job training for a unit supply specialist requires ten weeks of Basic Combat Training and eight weeks of Advanced Individual Training with on-the-job instructions. Part of this time is spent in the classroom and part in the field, including practice in handling and storing stock. Unit supply specialists learn the procedures for shipping, receiving, storing and issuing stock, as well as stock control and accounting procedures. They will manage the handling, movement, storage, and maintenance of ammunition, medical and food supplies. 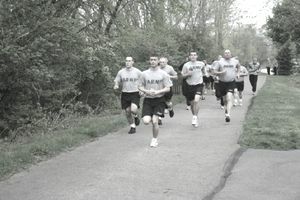 In order to qualify for MOS 92Y, recruits need to score at least a 90 on the Clerical segment of the Armed Services Vocational Aptitude Battery test. There's no security clearance required for this position and no strength requirement. In addition to the above requirements, a recruit must have normal color vision, that is, no color-blindness. To qualify for a unit supply specialist, a recruit must be free of documented instances of conduct which reflects adversely on the character, honesty or integrity of the soldier within the previous five years. Your record must be free of conviction by court-martials or in any federal or state court, and free of any juvenile adjudications in state court. You'll also need to have a record that does not include any punishment under Article 15, Uniform Code of Military Justice (UCMJ) caused by incidents that reflect adversely on the soldier's integrity and lack of trust. These disqualifications may be waived by a military review board. However, a conviction or other adverse disposition for criminal offenses listed as a misdemeanor or felony cannot be waived. In addition to the above requirements, there can be no other record of disciplinary action under the Uniform Code of Military Justice (UCMJ) or pattern of behavior that indicates a lack of integrity or that is inconsistent with the 92Y position of trust. In the civilian sector, the Unit Supply Specialist can find their skills and talents valuable in such civilian jobs as supervisors or managers of office and administrative support workers; purchasing agents, purchasing managers, shipping, receiving and traffic clerks, stock clerks and order fillers, and wholesale and retail buyers.